"It turns out that if you analyze the biochemical properties of RNA-binding proteins you see it's not just TDP-43 but several others that are also perturbed," says Aaron Gitler, a genetics professor at Stanford University who discusses the study in the same issue of eLife. "This is a new concept in how we think about these diseases—not just as TDP-43 diseases, but as RNA-binding protein diseases." 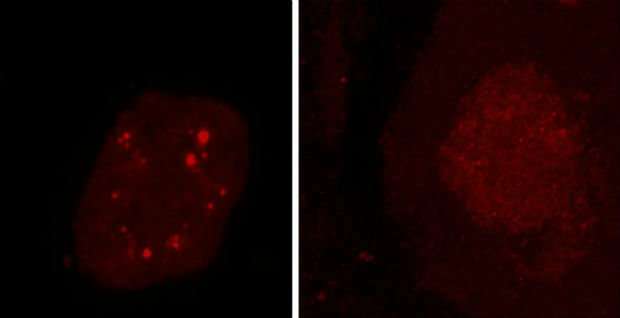 "RNA-binding proteins control how much proteins a gene makes," says the study's senior author, James Manley, a molecular biology professor at Columbia. "This process goes seriously awry when these aggregates are around." Neurons may be especially vulnerable to toxic protein accumulations, because unlike other cells, they can't divide or be replaced, but that doesn't explain why motor and cortical neurons are especially sensitive, says Conlon, now a postdoctoral researcher at Rockefeller University. Though much more still needs to be worked out, the study suggests that a blood test or other non-invasive way to detect ALS and frontotemporal dementia could soon be within reach. The findings also indicate that ALS comes in at least two forms—one in which RNA-binding function is disrupted, and the other with a still-unknown mechanism. "Our data suggests that we may be able to distinguish one subpopulation of ALS patients from the other," says study coauthor Dr. Neil Shneider, a neurology professor who heads Columbia University Irving Medical Center's Eleanor and Lou Gehrig ALS Center. "This could lead to a therapeutic intervention that works selectively on those patients."